Since beginning website design in the mid-1990's, we have gone through several major upgrades in our site "architecture," from early, primative efforts in Microsoft® FrontPage® to much more sophisticated techniques using Adobe® ColdFusion® application server and other tools. This site is built using the latest "GI-5" architecture. (Graphic Impact 5th generation). Search Engine Safe urls (web addresses) are easy to read for you and search engines. Two sample urls are shown, the first to the default view of this page, the second to explicitly request the Examples tab. In GI-5 sites the url is a series of keywords following the domain name. GI-4 sites also use keywords, but had to include a "base page" and use a query string to pass additional information. In GI-2 and GI-3 sites, the url is a base page with a query string that contains all the information needed to display the page. This is still common on many sites. Search Engine Optimization is aided by allowing each page on the site to have its own title and meta description (meta keywords are no longer regarded as necessary because of their abuse and the way that search engines build their indexes). Object Relational Mapping (ORM) greatly reduces and simplifies the code required for database operations over standard SQL coding. Using a database has been fundamental to GI sites since GI-2, allowing information to be dynamically displayed in multiple views without duplicating data or having to create and maintain numerous html pages. In addition to the flexibility of output, links to documents, websites, mapping services, images, and other functions can be automatically created for the data required for a page. Page layout has been controlled primarily through Cascading Style Sheets (CSS), instead of html tables, since GI-3. This provides pixel-precise positioning and layering of elements as well as simplifying site-wide changes. There are still a few instances where an html table is still the appropriate choice, but they are rare. The standard width of sites has been increased from 800 to 1150 pixels (or more), to accommodate today's wider monitors. (The SJ Associates site you are viewing—and all sites upgraded since then—have been increased to 1200 pixels to allow 300px ads and other features in the right sidebar). Wherever possible, we use a compact page layout to reduce the extensive vertical scrolling required by many sites. This is done by breaking content into several shorter pages, or making use of tabbed (like this page) or accordion layout. When a longer page is used, it is common to provide a section menu on the page with "back to top" links at the end of sections. Enhancing each site is a set of Page Features (alerts, ads, quotes, testimonials, a mini-calendar or news summary, and more). The placement of the features can be customized by page. For articles, the number of features displayed is dynamically adjusted for the best fit based on the length of each article. A complete Content Management System, allows site administrators to maintain most site content. The CMS has been completely upgraded (version 3) along with the GI-5 architecture. A number of Standard Modules are available, the most common being Calendar, News, Media Gallery, and Resource Center. See more in this pdf document that describes the Content Management System and available modules. 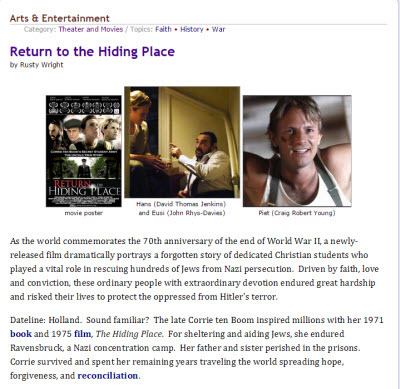 A Print Page option allows printing the core content, without header, footer and sidebars. 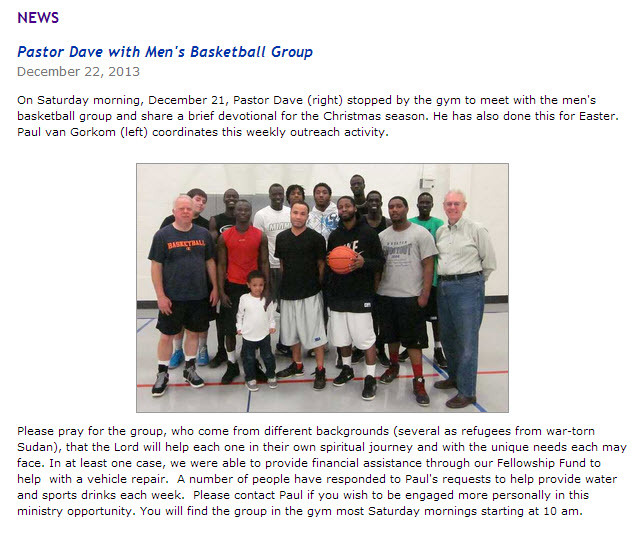 When a page uses tabbed layout (such as this one), the content of the selected tab is printed. It recognizes any text size adjustments, an aid particularly to users who need larger text. When the print option is active on a page, the Share option from AddThis.com is also included. Site architecture has evolved from a basic Model-View-Controller (MVC) approach introduced with GI-3. This separates background tasks, many of which can be shared with multiple pages, from the actual display. MS-SQL databases are used on each site to maintain and deliver a majority of site content, an improvement over the original Access databases used with GI-2—and far superior to those first efforts written entirely with discrete html pages. Random number generators are used throughout sites to rotate content. On this site, for example, one is used to call up quotes in the right sidebar. Others determine which ads or promotion for one of our other websites are displayed. Because browsers now include good zoom features, the font-size adjustment available on older sites has been dropped. 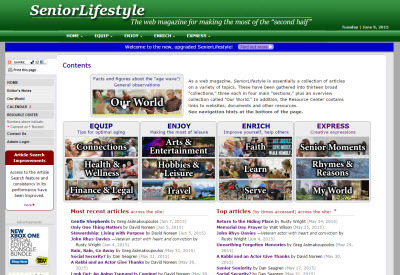 SeniorLifestyle was updated to GI-5/CMS-3 from a GI-3 site in May 2015. The site is built around articles by a team of contributors organized in 13 topical "collections." There is a robust search engine to find articles (more than 1,000 already) and the ads on the site are served dynamically to adjust for page length (we are an affiliate of the Rakuten LinkShare advertising program). 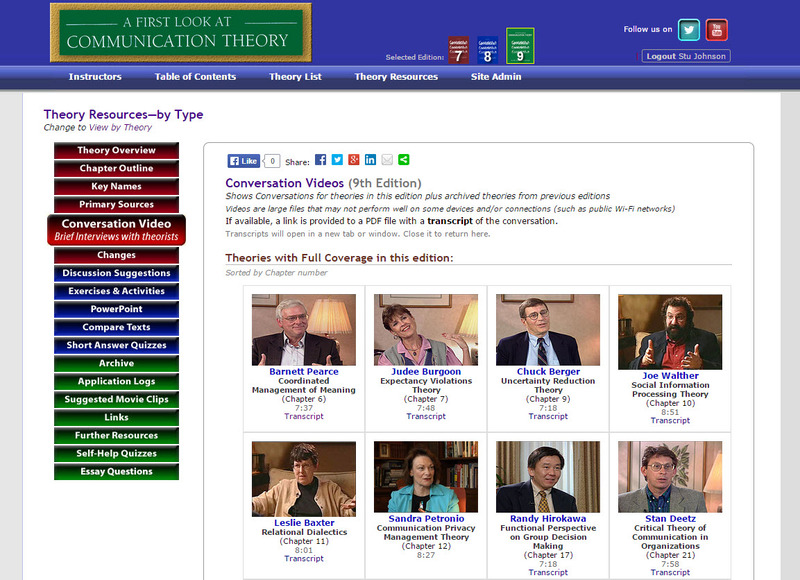 A First Look (custom) is a companion site to the leading college text in communication theory. An upgrade in 2014 for the 9th Edition of the text expanded on improvements made with previous edition upgrades, which occur every two to three years. The latest improvements included a wider layout, better integration of videos (and exclusive use of MP4 video files), and all standard features of GI-5 sites. The heart of the site is the Theory Resources section, which uses Ajax technology to present details from a list of up to 18 types of information available for each chapter of the text. Some of those resources are availble only to authorized instructors. 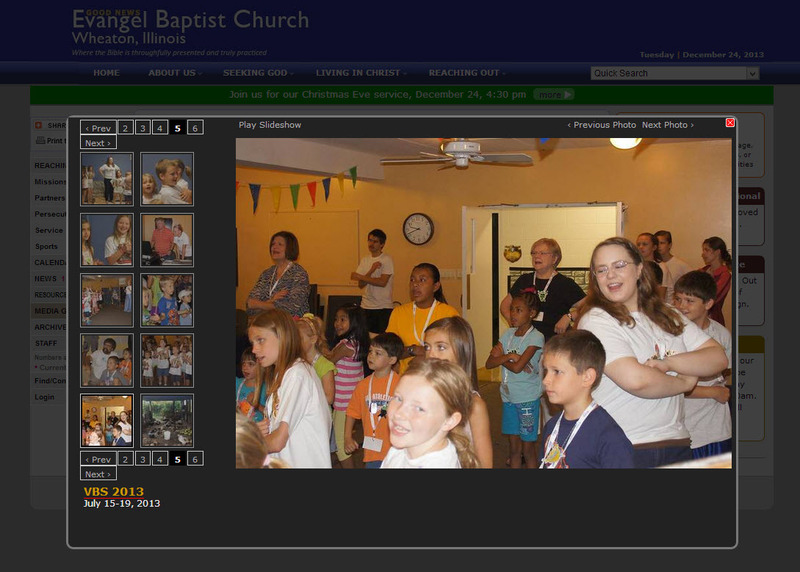 Evangel Baptist Church was upgraded to GI-5/CMS-3 in December 2013. It makes extensive use of standard modules and site features. Wayne Township was the first site to be upgraded to the full GI-5/CMS-3 implementation, in the fall of 2013. 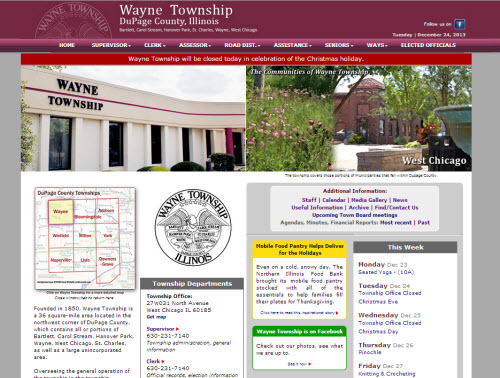 Evangel Baptist Church and Wayne Township both make good use of Calendar, Gallery (left), News (right), Resource Center and other modules, along with the new Page Features. 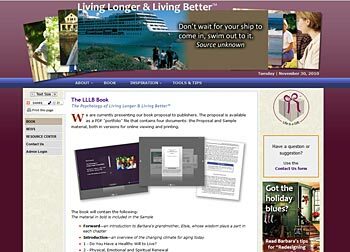 Living Longer & Living Better was the first site to use an early version of GI-5. It will be upgraded to the full implementation in 2015 and new features will be added. 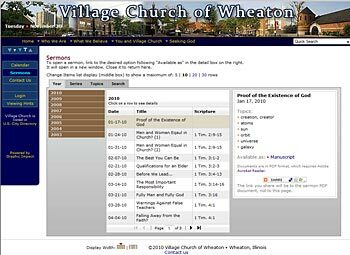 Village Church of Wheaton (GI-4) uses the first approach to Search Engine Safe urls, which still required a base page (main.cfm/about). 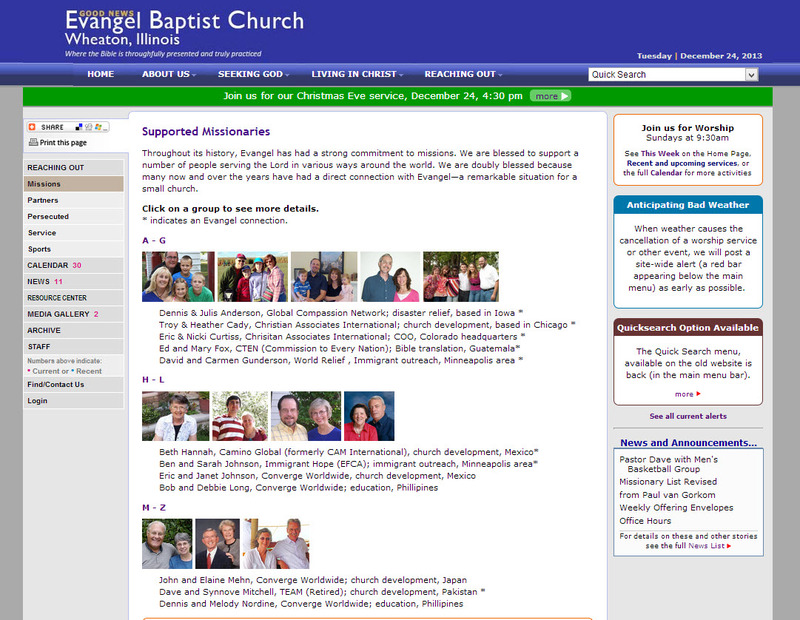 It also features a sermon directory that makes use of Ajax technology to reduce page refreshing.